Look at the unit carefully to make sure that it is not damaged, and that the mountings are the right type. If dampers are worn or damaged they affect not only ride and comfort but also cornering, braking and tyre wear. The car may also fail a roadworthiness test. Modern telescopic dampers cannot be overhauled at home. The only servicing possible is to replace rubber bushes (See Checking damper units). Dampers that are leaking, damaged or worn out (See Checking damper units) should be replaced with new units. Fitting new dampers is usually straightforward, and can be done with a few medium-sized ring spanners or ratchet sockets. On combined coil-spring and damper units you will also need to use spring compressors; hire from a tool hire shop if necessary. The force in a compressed spring is considerable, and a make-shift compressor could slip, allowing the spring to expand suddenly and maybe cause damage or injury. For cars with MacPherson-strut suspension, new damper inserts can be fitted to the strut (See Renewing MacPherson-strut inserts). Always replace dampers in axle sets - both rear and front - otherwise the car handling becomes unbalanced. You can buy dampers from a car accessory shop, or order them from an authorised agent. Always give the correct make, model, year and chassis number of the car; note that saloons and estate cars of the same model may have slightly different dampers. Apart from the standard dampers for a particular model, dampers at different ratings are also available. They are designed for particular characteristics, such as handling and load bearing. Ask for advice about up-rated dampers at an accessory shop specialising in suspension parts. Combined coil springs and front dampers may be located on an upper wishbone suspension arm. 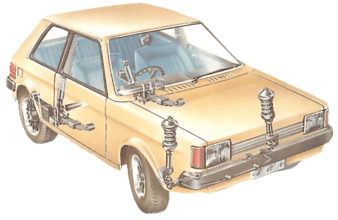 A number of modern cars have a front suspension system with an upper wishbone-shaped arm attached to the inner wing or an outrigger, and a lower wishbone arm attached to the chassis. The dampers are usually fitted between the lower wishbone arm and the inner wing or outrigger. A few makes have the bottom damper mounting on the upper wishbone. Where the wishbone suspension incorporates a coil spring, the damper is usually mounted within the spring, but can be removed without dismantling the spring. With torsion-bar suspension the lower damper mounting may also secure an anti-rollbar. On some cars, however, the coil spring and damper are combined, and the spring has to be dismantled and fitted to the new damper. Sometimes, particularly where the coil spring bears on the upper wishbone, the spring must be compressed before the damper is removed from the car. With either coil-spring or torsion-bar suspension, the lower wishbone must be jacked up to take the load off the damper bolts before you remove the damper from the car. Where there is one securing nut, hold the flat or squared end of the pin with self-locking grips while you undo the nut with a spanner. An upper pin mounting is the threaded end of the damper piston rod, and may have one or two securing nuts. Before undoing it, note the sequence of rubbers and washers on each side of the body panel through which it is mounted. Also measure the length of the thread protruding above the top nut. It must be the same when refitting. Where there are two securing nuts, use an open-ended spanner to hold the lower one while you unscrew the other with a second spanner. When fitting new dampers for both pin and eye mountings always use the new rubbers, spacers, washers and nuts supplied; make sure they are in the right sequence noted when dismantling. Nuts may have to be tightened to a specific torque setting with a torque wrench; check with a dealer or in the car service manual. Where there are two nuts, the setting applies to the first, lower but; the other is a locknut. Apply the handbrake and chock both rear wheels. Take off the hub caps or wheel embellishers and slacken the wheel nuts. Jack up the front of the car and support it on axle stands under the chassis, so that the weight is off the suspension. Remove both front wheels. Examine the upper and lower damper mountings to find out which type of fitting is used (See Checking damper units). Note where any washers, rubbers and spacers are positioned. Place a jack under the lower suspension arm; if the damper is fixed to the lower arm, make sure the jack does not block access to the bottom mounting bolt or nut. It may be possible to position the jack under the wheel mounting flange. This will ensure free access to the damper and its mountings. Raise the jack to lift the suspension arm; this will compress the spring and damper slightly and take the load off the damper mountings. Do not remove the jack until the new damper has been fitted. On some coil-spring suspensions, you may need to compress the spring (See Coil springs replacement) before undoing mountings. If the top mounting is a threaded pin, note carefully how much of the thread sticks up above the top nut, as it must protrude by the same amount when refitted. Measure the thread protrusion above the nut with a 6 in. (150 mm) rule. On some cars, the upper mounting may be a bushed eye and pivot bolt, like the lower mounting. Undo the pin mounting (See ) at the top and bottom of the damper. If the nuts and bolts are corroded and difficult to remove, soak them for at least an hour with penetrating oil before attempting to take off the damper. New dampers are usually supplied complete with rubber bushes, washers, spacers and nuts. Always use the new fixings, not the ones you have removed. Reassemble the mountings in the order of removal, with correct pin measurements and torque settings for tightening nuts. Final tightening of damper mountings is usually done with the car still raised, although it is sometimes done after the car has been lowered to the ground; check with the car service manual or a dealer. The lower eye pivot may be held by bolts through the suspension arm. Notes whether the bolt head on the top mounting fits towards the front of the car. Refit the same way. Remove the damper downwards through the suspension arm. With the car supported on axle stands and the front wheels removed, jack up the lower suspension arm to take the spring pressure off the damper mounting bolts. Both the upper and lower damper mountings may be bushed eyes and pivots, but the lower one is likely to have its pivot held by bolts through the suspension arm. Remove the top and bottom mounting bolts and slide the damper out through the bottom arm of the suspension. Use a pair of spring compressors, one on each side, tightening them alternately a little at a time. Spring compressors may be needed to the reduce the tension on a coil spring before the damper is removed from the car. Failure to use them could be dangerous. 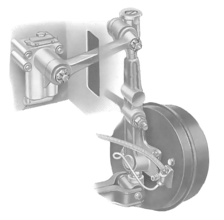 On some cars, the combined coil-spring and damper unit can be removed without first fitting a spring compressor. Check in the car service manual. Once the unit is removed, however, compressors will be needed to compress the spring to separate it from the damper. For safety, if you are in any doubt, always fit the spring compressors before you remove the damper unit. Use a pair of spring compressors on each side, tightening them a little at a time. Undo the spring-cup mounting nuts under the bonnet. Remove the pivot bolt to release the bushed-eye lower mounting. Where there is a combined coil spring and damper - as in some Triumph cars, including the Dolomite - the bottom of the damper is often located in the upper wishbone. With the front of the car supported on axle stands, the front wheels removed, and the suspension arm jacked up, fit spring compressors to compress the coil spring (See Coil springs replacement) so that you can remove the damper. With the spring held by compressors and the unit in a vice, hold the damper piston rod with grips while you undo the cup securing nut. Remove the nut, bush, washers, cup and ring. Undo the nuts holding the upper mounting of the damper. It is usually a spring cup held in place by the nut on the end of the piston rod. The cup is secured to the inner wing by three or four bolts, reached from under the bonnet. Unbolt the lower bushed-eye mounting (See ) and compress the damper by hand to lift the bottom end off the upper wishbone. To remove the damper, pull it down to clear the upper wing. Place the compressed spring and damper in a vice; if necessary, compress the spring further so you can turn the spring cup. Remove the nut holding the cup, and take off the rubber bush, washers, cup and spring insulating ring. Note the sequence so that parts can be refitted in the same way. Remove the compressed spring and fit it to the new unit. Fit the spring-cup components. The lip of the spring insulating ring should be inside the coil spring. Refit the damper to the car, and secure the mountings before removing the spring compressor. Tighten nuts to the correct torque setting if one is specified. Tap out the pivot bolt from the lower mounting with a drift. Push the damper rod in and lower it from the car. On cars with torsion-bars, such as the classic Renault 5, the upper mounting is often a threaded pin reached from under the bonnet, the lower one a bushed eye and pivot. It may also secure an anti-roll-bar mounting. Undo the mountings. To remove the damper, lower it through the wishbone arm.